Giving personal information is part and parcel of applying for any type of loan. The information is used by the lenders to both verify the applicant's identity and to asses whether or not the applicant will be a good or bad credit risk. With the threat of identity theft, bank applications have become more stringent than ever before with regards to loan applications and personal information, and actual proof of these details. Do not fill out an application form until you have found the right loan to suit your needs. Applying for loan using an application process will leave a credit footprint with credit reference agencies regardless of whether you are applying for a loan online or in person. Lenders check credit reference agencies every time you apply for a loan and this is where the footprints will come from. If lenders see that you have many applications, whether they have been refused or not, then it will seem as if you are over committing yourself or being turned down continually. In the first instance only ask for a loan quote until you decide the loan is right for you. Never allow credit searches until you decide to actually apply for the loan. Applicant's name and address, and length of time at present address. Previous addresses if you have lived at your present address for less than three years. Name and addresses for a second applicant if required. Amount of present debt including mortgages and credit cards. The value of the property if you have a mortgage.Current bank account details. Lenders will also usually want to know whether or not the applicant is a UK resident, and many lenders will stop an application immediately if the applicant is not resident in the UK. Lenders will also require the applicant's date of birth, the amount of loan, and the required length of the loan. There will be a section to fill in regarding marital status and number of dependants, if any. Applicants will need to fill out a detailed accommodation section. This will include their present address and whether they are a homeowner or tenant. Lenders will also want to know previous addresses if the applicant has lived in the accommodation for only a few years. All of this information will be used to verify the applicant's identity and used when checking credit references. Another important section on the loan application form is the employment details section. Lenders will want to known the name and address of the applicant's employer as well as the length of time they have been employed. They may also want know previous employer's details, and they will require salary details. Lenders will usually need details of both gross annual income and net income, the frequency of payment and any other regular income details. They will also want to know how the applicant's wages are paid; for example by cheque or into a bank account. Salary details are important and do go someway to whether or not the loan will be offered. Even if the applicant has a poor credit record they may still be offered a loan depending on the salary details and the lender's own judgement. Self employed applicants will need to have been in business for around two years before they are usually considered for a personal loan. Loan applications and personal details will include present bank account details including the length of time at the bank and sort codes and account numbers. Lenders will also want to know details of other debts including mortgages, credit cards, store cards and loans, and the overall payment totals of these debts. They may also want to know whether or not the applicant holds a cheque book and/or a debit card. All of these figures will be used to see if the applicant is overcommitted in terms of debt, and if the applicant will be able to afford the repayments of the required loan. The lender will also require proof of many of these details which could take the form of wages slips, bank statements, and proof of accommodation details. 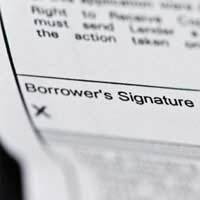 With identity theft on the increase, lenders now rigorously check loan applicant's details along with documents of proof. Answering all details honestly is vital and there can be severe consequences for any applicant who lies to obtain a loan.